Absolute silence, except for the breathing in my snorkel. A sleek, dark black body suddenly appears, gliding silently, effortlessly, close enough to touch. Just as quickly it’s gone. Another appears. The narrow, pointed head, small ears, bull neck, and powerful flippers are huge in the crystal clear, tepid water. The sea lion’s large brown eyes look directly at me as it rolls, dives, and frolics with dolphin-like antics. Out of the corner of my eye a large green sea turtle emerges, flippers paddling rhythmically. I follow while also keeping a close eye on the sharks cruising on the bottom amongst a myriad of brilliantly-colored tropical fish. I cautiously distance myself from a gigantic manta ray ghosting along. This rendezvous with the Galapagos Islands’ wildlife has been a lifelong dream. Straddling the equator 621 miles from the Ecuador mainland, the 19 islands that make up the archipelago still have the same struck-with-wonder impact on visitors as they did on Charles Darwin in 1835. But you don’t need to have read his “Voyage of the Beagle” or “The Origin of Species” to realize that these islands are something special. On land the same diversity and friendliness greet us. Many animals are endemic to specific islands. 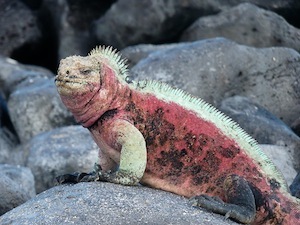 The three-foot-long red and green Marine Iguana (from the dinosaur age) are so plentiful and tame there is a real danger of stepping on them. They have a gland in the head that separates the salt from seawater so they can drink seawater. Occasionally they sneeze out the salt. Red crabs litter the rocks, penguins preen, and lizards scuttle, but the land is dominated by the innumerable sea lions lazing in all sorts of poses on the beach, rocks, and scrub. The air is full of wildlife as well. Various species of the little sparrow-like Darwin finch are everywhere. Large blue-footed boobies, frigates, swallow-tailed gulls, and mockingbirds dominate the skies. Innumerable cheeky pelicans with their huge beaks scoop up fish with ease. We’re on board the 46-foot sailing catamaran “Galapagos Vision” with nine passengers, a crew of five, and our guide. The Galapagos Islands straddle the equator. It’s hot, 105 degrees. There’s no wind so we can’t use the sails. The sea is flat. We keep cool by snorkeling twice a day or just jumping overboard. We travel at night between islands and arrive each morning in a new place. Sometimes there are six to eight other tourist boats anchored in the same bay, some with over 100 passengers! We awake one morning at Post Office Bay on Floreana. No one lives here but there is an old wine barrel which is used as a mailbox. All tourist boats call in and passengers post letters free to friends around the world. Everyone sorts through the mail to find any letters addressed to their parts of the world, which they then take to deliver personally. This tradition, started in the pirate days, is now continued by tourists. On Floreana there is also a lava tube, a pitch black tunnel nearly 20 feet in diameter created by a lava flow. A quick swim here was bracing. 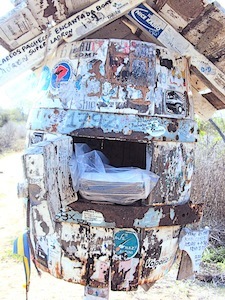 Our five-day trip ended on the island of Santa Cruz where the Charles Darwin Station is located. Sea lions once again line the footpaths. The very successful giant tortoise recovery program at the Darwin Centre has been operating for 30 years now. 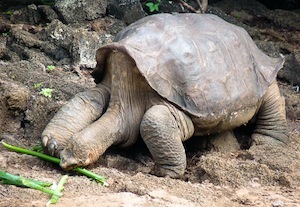 We visit the sad-looking “Lonesome George,” the 100-year-old last surviving member of his giant tortoise species. The Galapagos National Park does a wonderful job of maintaining the integrity and resources of the park but tourist numbers are increasing rapidly. 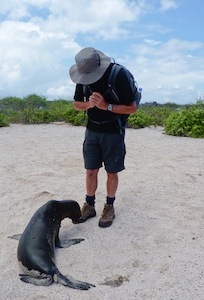 If you want to see the unspoiled beauty of the Galapagos before tourist saturation, don’t wait. There are a vast number of companies running tours with all sizes of boats to suit your style and budget, from $1,000 to $5,000 for three to seven days including food and snorkel and flippers. Accommodation Trips leave by air from Quito or Guayaquil in Ecuador.